The greatest problem for a retailer is when goods leave the retail store or the warehouse without a matching payment. In retail vernacular it is called ‘shrinkage’. Retail shrinkage is the difference between book stock and actual stock. Shrinkage is an industry hazard. It is believed that in stores shop lifting by customers is the prime reason for theft but the actual reason is not the customers who are walking away with unpaid goods: internal theft is the biggest cause of retail shrinkage worldwide, and so in India. In words of NV Sivakumar, Executive Director and Leader, Consumer and Industrial Products and Services Group, PricewaterhouseCoopers India, “In retailing, shrinkage (sometimes truncated to shrink) is the loss rate of products between point of manufacture and point of sale. Shrinkage is often considered a cost of doing business in retail.” Everyone in the retail world is aware that employee fraud happens but the scale of it has rarely been measured or admitted to by the retailers. The most common method of employee theft is 'sweet heartening'. It is a condition where an employee lets a 'sweet heart' friend walk away with some high-value items after paying for cheaper products. Credit card fraud is to use an invalid or stolen credit card for personal use. It is basically use of a credit card in a dishonest way for the purchase of certain commodities. This fraud includes misappropriation of funds of the sales in stores. 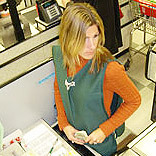 The cashier may steal money from the cash box while managing sales. Other activities interlinked with this are cutting of manual bills, which are not recorded, discount abuse and refund abuse. Employee fraud featured together with identity fraud is also on the rise. Some dishonest employees steal customer’s data to enable identity frauds to take place. Employee theft as said cannot be eradicated. It can only be checked upon. Technologies such as anti-shoplifting systems, digital video surveillance, point of sale monitoring solutions, installing RFIDs, sensors, IT solutions tied together with remote and central station monitoring are very useful for controlling the problem. One of the first steps retail consultants recommend is creating an organisation culture that fights loss. Technology alone will not eliminate retail theft, constant vigilance is a tactic all retailers need to adopt at every moment to tackle the theft they experience. Also recommended are daily checks on high valued items and regular checks on reasonably valued products. A display screen in the store that screens the movement of people should be put up; the perception that you are constantly monitored will make the employees hesitant about stealing. There should be no dead corners in the store and there should be plenty of open, well-lit spaces and wide aisles to ensure high visibility. Most retailers dismiss dishonest employees immediately, believing the permanent blot on the résumé as a penalty. Recently though, some retailers have adopted a zero-tolerance policy where they initiate criminal proceedings against erring employees. All these techniques will definitely help retailers contain some percentage of their losses. It used to be unusual to make a connection between employee frauds and organised crime, but increasingly, the links are becoming evident. Therefore retailers should work on this aspect and try to reduce shrinkage and increase the levels of profits for their firms.